From the temple art of Nineveh to Disney’s “The Lion King,” no animal has been such a potent and enduring symbol for the aspirations of men. Characterized as mighty, fierce, fearless, noble, magnanimous - that is, everything a king would like to be thought as. Today tourists flock to Africa on safaris with “lion” as the number one objective on their checklists. This trait seems to have been kept up over the years and is probably linked to the emergence of humankind on the African savannah, whose arrival closely followed that of the lion. We would have had the same predator/prey relationship as many animals still have today. Hanging around in groups for protection, our hominid ancestors would have had to keep a wary eye out for these big cats, for which hominids would have been an easy source of food. It seems it is this trait that brings us back time and time again to view these felines in their natural habitat. Imagine if we were able to transport ourselves back about 65 million years, we would find a world vastly different to that of today. The small mammal-like creature scurrying around between the legs of the mighty dinosaur would not jolt our memories as being related to the large cats that we know today. We would have to wait another 40 million years to recognize a familiar feline species. Living off insects and scavenged remains, a trait that may be recognizable in our modern times, these mammals lived in the shadow of the dinosaurs until the opportunity to evolve presented itself with the arrival of the meteorites. The most social of all cats, lions live in communes called “prides”, with an average of 15 members. Membership within a pride is highly-prized and is defended. To make sure that no unwanted felines gain access, pride identity is maintained by affectionate contact between all individuals. The greeting ceremony that all pride members go through upon meeting another is to prove membership and of the individual's peaceful intentions. Two lions approach one another, moaning softly, rub heads and flanks with tails raised and flicking. The flank-rubbing developes into a bit of pushing and shoving and it invariably ends up with one lion collapsing on top of the other. The fact that weaker animals tend to take the initiative when it comes to greeting ceremonies indicates that the greeting ceremony has an appeasing function as well. Pride membership and physical strength enable lions to hunt large prey, where they have an 20% chance of success. Lions, especially nomadic males, often scavenge from other predators. Research estimates show that about 50% of their food is obtained this way. The fact that males do not hunt turns out to be a long perpetuated myth. Males, because of their size, are needed in defending their territories from other males. Consequently, they are not as agile and quick as the females. Viewers often witness the females making a kill and then having the kill appropriated by the dominant male, where he is capable of gorging 25% of his own body weight in one sitting. Prides with resident males in tow have a much greater success at chasing hyenas off their kills. As dawn breaks on the African savannah, a drama that has been played out for many thousands of years begins to unfold. The characters and the scene are the same, yet a few hours ago the lead roles had been reversed. In the ink-black of the night, where we humans reluctantly venture, the hyenas have made a kill - only to have their hard work appropriated by the marauding lions. At first light, when we decide to head out, we find the scene, as we would like to see it - lions on “their” kill with hyenas waiting to scavenge. The antagonistic relationship between hyenas and lions is legendary, but with the same, predictable one-sided view of the story. Hyenas have long been thought of as cowardly scavengers, but the truth is that they are formidable hunters who lions rely on to steal from. Any predator that is capable of running lions off kills and causing them to seek undignified refuge in trees, cannot justifiably deserve the title of coward. Dominance within the pride is based purely on size and aggression and as this gets played out down the line, it is the young cubs that suffer the most. The high mortality is directly linked to the low hunting success rate and combined with the most aggressive individuals getting the majority of the food, results in a low survival rate amongst the cubs. Once the male has had his fill and the adult females have fed on the remains, invariably there is not much left for the young to feed on. So, in times of marginal hunting the survival rate of cubs becomes spectacularly low. Not only do they have to survive a tough rite of passage, where there has been 3000 copulations for every cub that survives to a year old, but a lion cub still has to face the most dangerous predator of them all: the adult lions themselves. 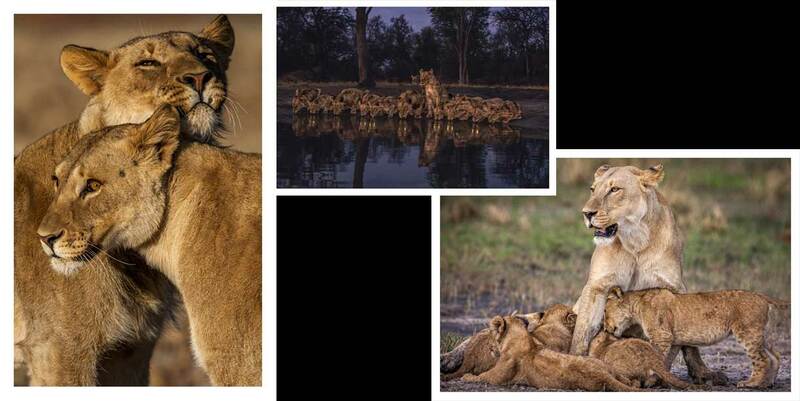 The number one priority for male lions taking over a new pride territory is to get the pride females back into heat. They do this by killing all the suckling cubs that they can get their paws on. Lionesses will defend the cubs quite vigorously and in the process these mothers are often killed. If lucky, they will manage to escape with their cubs. The killing of the cubs is justified by the short tenure that the males will have at being dominant, usually an average of two years, which is also the normal interval between births. Given so little time to propagate their genes, sexual selection rewards the males that kill all the suckling young of defeated rivals. When a nursing female loses her cubs, she comes into oestrus within a few weeks. After the takeover, the female will often come into heat every few weeks for up to five months without becoming pregnant. This interval of sexual hyperactivity is a form of insurance against desertion and also allows time for the biggest and strongest coalition to move in and settle down. When the sterility period ends - pride females ovulate, conceive and litter in synchrony. Opportunism and energy conservation are the key ingredients of carnivore success and nowhere is this more apparent than on the African plains with a pride of lions. Out of a total of 24 hours lions manage to spend about 20 of these hours sleeping or as many would like to call it, conserving energy. Public opinion on the lion is either positive or negative; rarely do feelings fall in between. Throughout history the lion has been the symbol of power and nobility, but an actual lion met face to face may elicit other emotions. Early hunters and settlers in Africa saw them as vermin, and were treated accordingly: shot on sight. Public opinion waned once again as the “man-eaters of Tsavo” made them infamous for killing humans. The "Born Free" trilogy brought a very different view of lions to the average man on the street. As public hearts opened to these endearing creatures, the full attention of the media was kicked into gear. For more than ten years not a negative word was uttered about the mighty lion, until modern scientific studies began to appear and researchers began characterizing lions as lazy, selfish, scavengers, murderers, bad mothers, rotten fathers and many more. However, these views have not trickled down to the average tourist who still wants to see lion more than any other animal in the wild.